Mind's Eye Fiction is the creation of publisher Ken Jenks, a "computer guru" for NASA in Houston. But the interests of this computer expert run far beyond launching the next space shuttle in the sky. He hopes to launch the future of fiction on the Internet. His vision is embodied in his creation of the cutting edge website, Mind's Eye Fiction. Mind's Eye publishes short stories on its site. Readers get to read the beginning of the story for free -- if they like it and want to read the ending, they pay a small fee to read the ending or, read an interactive advertisement and the advertiser pays for it. Authors are paid out of the proceeds of the sales of the end of their stories. Ken's site has attracted major interest both online and offline -- Ken was a panelist at this year's World Science Fiction Convention, WorldCon, held in San Antonio over Labor Day weekend. We talked with Ken about his unique and imaginative site. Tell us about the founding of Mind's Eye Fiction. "I founded Mind's Eye Fiction in December, 1995, with the mission to improve the quality of fiction available on the Internet. I convinced writers, artists, editors and programmers to contribute to the effort in the old-fashioned way: I pay them money. This turns out to be a very popular method of convincing people to work with you. I highly recommend it to publishers everywhere." Where do you see the publication going in the future? "We're constantly expanding, both in the number of stories an authors at our site and in the number of users coming in to read the best stories on the Internet. Editorially, I'm taking the publication in the direction of more stories per month (we're averaging about four right now), with more stories in the mystery and romance genres. Technically, I have four programmers at work upgrading our database and transaction systems -- those behind-the-scenes programs that allow our unique pay-per-view system to operate -- with a scheduled release of the new software on a new server in January, 1998. Artistically, we're planning an overhaul of the graphics at the site for the same time period. Our Web site was cutting-edge design in 1995. Today, it's servicible but lack-luster." Ken talked about the effect the Internet has had on the publishing industry. 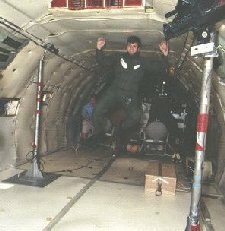 Publisher Ken Jenks "floating around" inside a NASA research aircraft, the KC-135. Fiction to see who comes up with a profitible publication process. I feel that when we prove the technology and the business case, other publishers will follow along. So far, Mind's Eye Fiction is all alone in the niche market of pay-per-view electronic short stories. There are quite a few efforts at pay-per-view electronic novels, but these efforts have usually met with long, agonizing failure. Computer display technology is just not ready to let people read novels on-line -- you can't bring your computer to your easy chair or the beach. Short stories work just fine." We asked him to describe how a reader can buy the "end" of a story on Mind's Eye Fiction. "First, find a story you like. Read the first part -- they're always free. If you like it, and you want to read the ending, you can open an account, using check, cash, money order, credit card or a 900-number. Then you can read the end of the story. Your account will be debited for each ending you buy." "Alternatively, for those stories with sponsors, you can read the first part for free, then read an ad. In exchange for your participation in their advertising campaign, our sponsors will pay the royalty for you to read the end of the story." How effective has it been for your writers? "Remember that there isn't much money in the short story market. Writers selling stories to professional magazines typically earn a couple hundred dollars per story. We're a semi-pro market, and we publish both reprints and first-run stories. Writers can earn up to about $10 per month, sometimes more, but often less -- all depending on the number of people who (a) find the story, and (b) pay for the ending. After taxes and transaction fees, writers keep 75%, we keep 25%." Who are some writers who have been featured? "The most famous ones are science fiction authors Larry Niven, David Brin, Spider Robinson, Fred Saberhagen, Marriane Dyson, and Bud Sparhawk, but our complete list is at http://tale.com/authors.htm." Do you have any tips for writers looking to get published in Mind's Eye Fiction? "In general, authors e-mail us stories. We post them on the Web. People buy them. We send authors checks. As with any publication, writers should read a few stories and carefully follow the guidelines. Only submit stories that you think I'll like -- we reject about 96% of the stories submitted." Is cybercash and having a reader "view ads" to see the end of a story or article the future of publishing on the internet? Or will it be overtaken or blend in with paying subscriptions? "Just as in magazine publication, there are a variety of revenue streams available to Internet-based publishers, including subscriptions, advertising and selling mailing list, but also the unique Internet capabilities of pay-per-view publication. The future will be full of these and even more confusing mixtures, to the benefit of authors and the confusion of readers everywhere." What are your plans for the future of Mind's Eye Fiction? "We'll be expanding in many ways, but we're staying focused on our primary mission: improving the quality of fiction available on-line."